Public housing is at a crossroads, buffeted by demographic, economic, and political winds. Privatization, rehabilitation, demolition, rent certificates and vouchers, tenant management, tenant ownership, resident empowerment: these are just some of the current and proposed policy initiatives that could change the face of urban public housing.In this book the nation's foremost housing policy experts explore the problems and identify solutions that will define the future of this essential housing sector. The contributors review the origins of public housing policy, probe the current policy climate, and anticipate new directions. 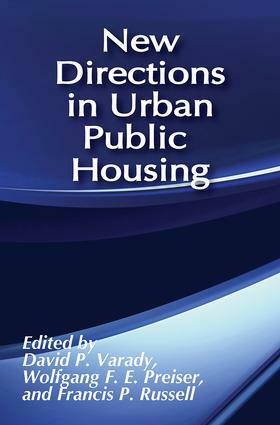 Chapters are illustrated with case studies from Boston, Chicago, Decatur, Indianapolis, San Francisco, and Seattle, as well as the United Kingdom.The book contains sections addressing: historical perspectives, social issues, design issues, comprehensive approaches to public housing revitalization, and future directions. The contributors include: Alexander von Hoffman, Peter Marcuse, William Petersen, Leonard F. Heumann, Karen A. Franck, David M. Schnee, Gayle Epp, Lawrence J. Vale, Richard Best, Mary K. Nenno, Irving Welfeld, and James G. Stockard, Jr. This book should be read by all city planners, housing officials, and government personnel.